- We deal in ultraviolet light for using magnetic particle testing. - We have high intensity and low intensity both u.v. lights. - We supply our products in all governments and private sector. 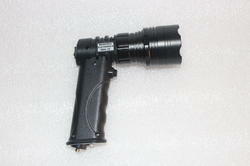 We are also supplying UV Torches. We have been able to design an exquisite UV Torch. Provided torch is manufactured using premium quality components and ultra-modern technology at our trusted. • Single LED low wavelength output provides a brighter fluoresce for 4-In-1 (B715) leak detection dye. 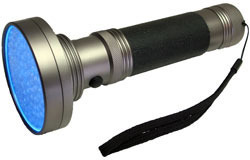 We have attained a notable position in the market by offering the finest quality array of UV LED Torch. It designed for quick inspections in unreachable spots. This small tube model portable 6 volts UV lamp, is best to be used with all fluorescent/fluorescent magnetic powders, comes with 4 batteries & a wrist carrying strap. Combine the superiority of our fluorescent powders with the performance of this Ultraviolet Hand Lamp to get the best Possible results. We sell UV torch which is used for many purposes including Post Curing and soldering of broken CAM Pieces, RPTs made by SLA/DLP/UV LED/LCD 3D Printers.